This is The One—the one that Ansel Adams made famous in his shot of Yosemite Valley from Inspiration Point. 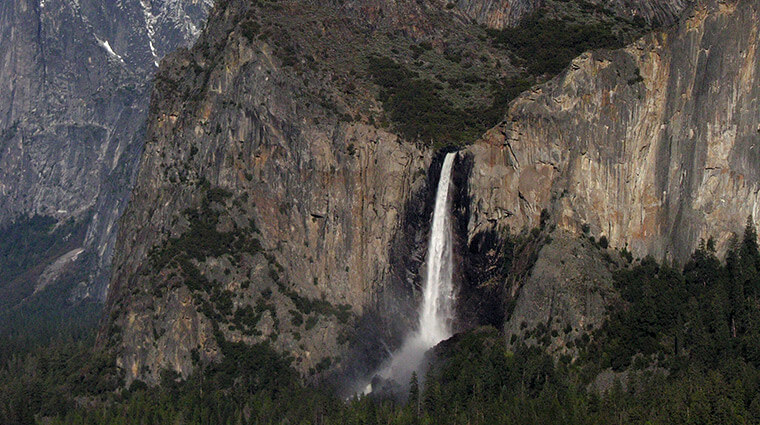 Bridalveil Fall is one of Yosemite’s most iconic waterfalls, probably second only to its big sister, Yosemite Falls. You can easily hike the paved trail up to the base of Bridalveil Fall and in peak flow you’ll enjoy the drenching mists that swirl at the base of the falls. A poncho is recommended in early spring. The trail is wheelchair accessible and pet-friendly as long as your furry friends are on a leash. The best time to visit Bridalveil Fall is early spring. However, even a modest rainfall brings this waterfall back to life, so it can be flowing almost year round, except for at the end of summer and early fall. This is an excellent trail for hiking year round, although you may encounter icy conditions in winter.